Waiting for an external Apple 5K display for Mac Pros or other Macs? If I had to guess, you’ll have a long wait, and they won’t work with any Mac sold to date. 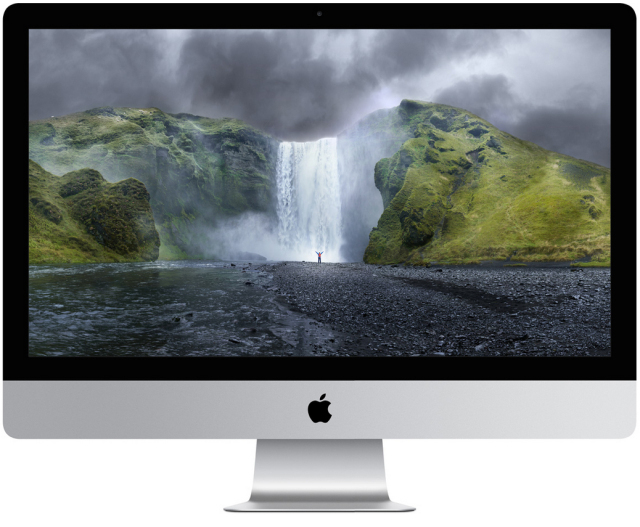 Panel yields may be tight for a while, and external displays are a low priority for Apple. The original 27” iMac’s groundbreaking LCD panel wasn’t available in an external display from Apple for almost a year after its release. But that’s not the biggest problem. Pushing this many pixels requires more bandwidth than DisplayPort 1.2 offers, which is what Thunderbolt 2 ports use for outputting video signals. (I wrote about this a few times.) Doing it right will require waiting until DisplayPort 1.3 in Thunderbolt 3 on Broadwell’s successor, Skylake, which isn’t supposed to come out for at least another year — and Intel is even worse at estimating ship dates than I am, so it’s likely to be longer. It may be possible to use two DisplayPort 1.2 or Thunderbolt 2 cables to power a 5K display, but only if the GPU could treat each port as its own full-bandwidth DisplayPort 1.2 channel, the sum of which represented one logical display, and had the panel combine and properly sync the two at the other end.1 I don’t think any of the current Macs can do this, including the Mac Pro — MST to run 4K panels at 60 Hz only seems to be supported within individual ports, not spanned across two. I’d estimate — granted, I’m wrong a lot — that Apple won’t ship a standalone 5K display until at least 2016, and it won’t work with any of today’s Macs, including the 2013 Mac Pro. How many Thunderbolt devices can you connect to a Mac Pro? A lot. Wow! What are these? Can U name them? Dan Benjamin: So Jim, do you have a Mac Pro yet? Jim Dalrymple: No Mac Pro for me. After talking about everything that we did on a Mac Pro, I wonder how many people actually need a Mac Pro. When I look at what I do at my current Mac Pro, do I need a new Mac Pro in order to do all of those same thing? No, I don’t. Do I need a new Mac Pro? — No. No Mac Pro for me. Right now I have no plans for a new Mac Pro. Dan: You changed that. it’s all that history now. The Mac Pro (2013) has a fan system capable of cooling the computer in a vertical or horizontal orientation as long as you follow these guidelines. – Provide enough space at each end of the computer for unrestricted airflow into the base and out the exhaust at the top. Make sure that the air intake and exhaust ports are not covered. – When using multiple Mac Pro (Late 2013) computers, do not direct the exhaust at the top of one Mac Pro towards the intake of another system. Place the computers side by side with a gap of at least several inches between them. – When on its side, secure the Mac Pro (Late 2013) to be sure that it doesn’t roll. Place the computer on a protective surface that will not scratch or damage the enclosure. Note: The Apple Limited Warranty does not cover cosmetic damage to the enclosure. – Orient the computer so that the Input/Output (I/O) panel remains accessible during use. The new Mac Pro is built to be taken apart. This well-executed teardown from iFixit shows off the engineering excellence behind the Mac Pro design. The teardown starts by removing the cover. Slide the lock-switch, pull off the cover. So easy. Truly a thing of beauty. This leaves us with two upright graphics cards, forming the two legs of an isosceles triangle. One of the cards has an SSD mounted on it. The i/o panel, with its RAM slots forms the short leg of the triangle. The RAM cards are easily removable. Undo a single Torx 8 screw to remove the SSD. The two cards and the i/o panel are all attached to a giant triangular heat sink, the core of the entire operation. This is a fair point. Tough to replace these GPUs as they age. I’ve done a fair amount of disassembly, repair, and upgrade on Macs over the years. This one seems much more accessible than most. That said, there clearly are limits to what you can do yourself. Upgrading from a base CPU to a higher-core CPU may be within reach for the handy, but there doesn’t appear to be any way to add additional storage or upgrade GPUs. Dig in to the teardown for all the gory details. Personally, I think the Mac Pro is a home run. I get the limitations, but the elegance of this design, the sheer power that the new Mac Pro brings to the table is plenty enough for me. As I said, a real thing of beauty. Well those 6 Thunderbolt ports on the back of the new Mac Pro were just staring me in the face to try ‘em all out. Since the new Mac Pro can do three 4k monitors, I thought it should be able to handle six 27″ displays. Yup, it sure did. All six 27″ 2560 x 1440 displays ran at full resolution. Five Dells, one Apple cinema display, all connected via mini DisplayPort.